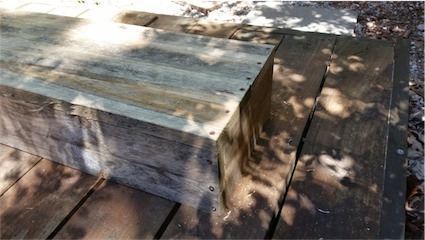 It’s been a while, but I wanted to post about the planter I have just built to grow tomatoes in. 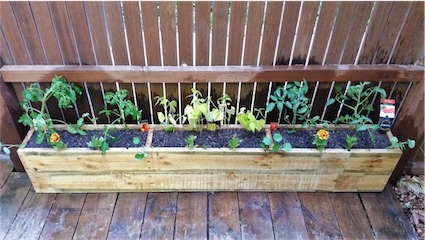 Plants – $31.66 – Heirloom Tomatoes $3.79 x 2, Mini Roma $6.17 x 2, Butter Beans $4.36 x 1, Marigolds $3.02 x 1, Nasturtiums $4.36 x 1. 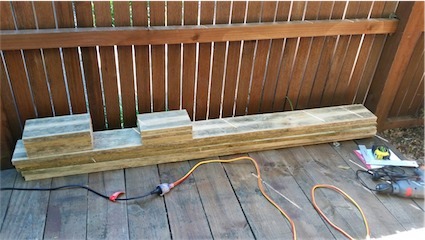 Anyway to get to the details, I started with 3 lengths of 3.6 – which I cut to 1.8 lengths with a drop saw. I then cut one of the lengths up into smaller sections. This was for the sides and dividers. Each of the smaller lengths were 275mm long (the width of two boards on top of each other, minus the height of the bottom board). 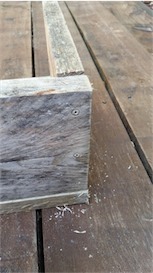 I also cut three equal length sections with the remaining timber to use as feet. I didn’t end up doing that, but it would be good if you needed to have better drainage. The next thing I did was line it all up on the deck to make sure if fit together. A very important step – it’s good to find out problems before you start screwing things together. 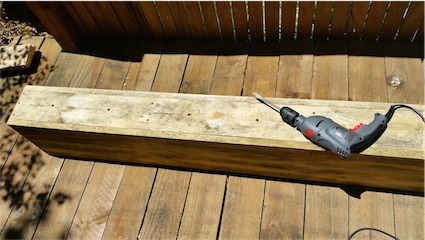 Then I needed to drill some pilot holes for the screws holding the ends on. 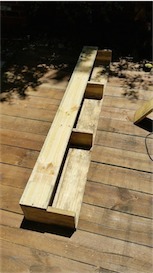 I used the timber I would be putting on the side as a guide, lined it up and then drilled. I also used a larger bit after the first one as a counter sink. 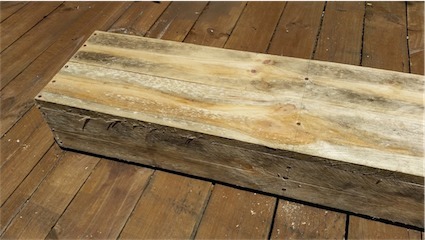 I then found it easier to stand it up like a bench with the bottom up in the air. The three screws in each side gave it enough strength to hold it together. Once I was happy with the bottom and ends, I attached the two boards on the one side. These then matched up with the ends to keep it all square. 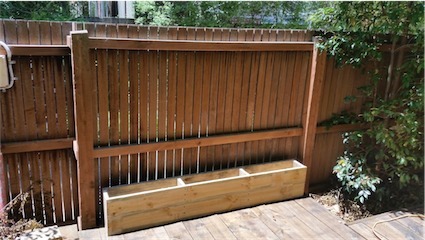 After that the dividers needed to go in for both strength and to separate the plants. 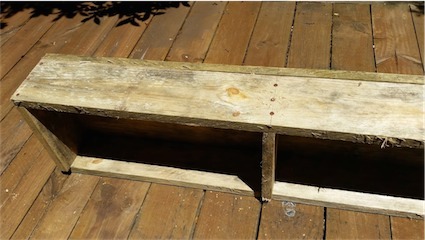 I measured the board in thirds and then drilled and screwed from the bottom first, then from the side. 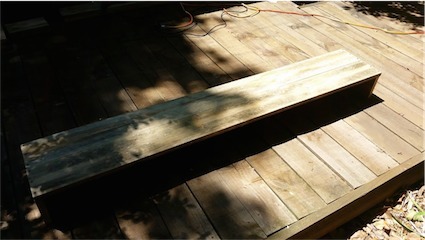 I then attached the last two boards in the same way, starting with the two ends first and then the dividers. Once they were done, the box was complete. 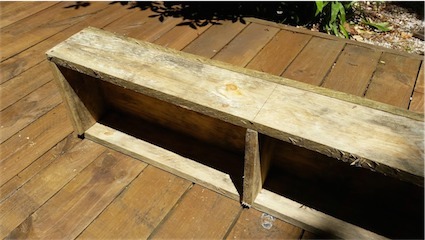 I just put some drainage holes in the bottom with a hole drilling bit away from the dividers. 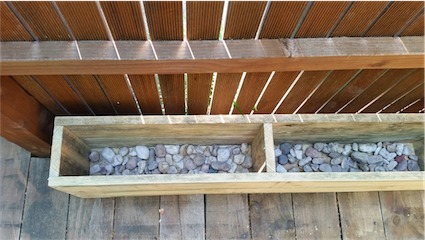 I then put some rocks in the bottom to help with drainage, and some rocky soil mixed with potting mix for a base. I later put another bag of potting mix and also organic compost in there as well. All up, I think I used about 100 litres of soil. I planted two plants of heirloom tomatoes (big juicy ones) on the left, with mini romas on the right (they grow in clusters, almost like grapes). In the middle I put in Butter Beans for something different. All of these can be tied to the fence to help with their growth. Once they start to grow, I’ll tie them up with old pantyhose (because it’s flexible) or wire if needed. Around the front and side I planted Nasturtiums and Marigolds because they not only look nice, but help keep pests away from my tomatoes without using pesticides. The more organic the better.